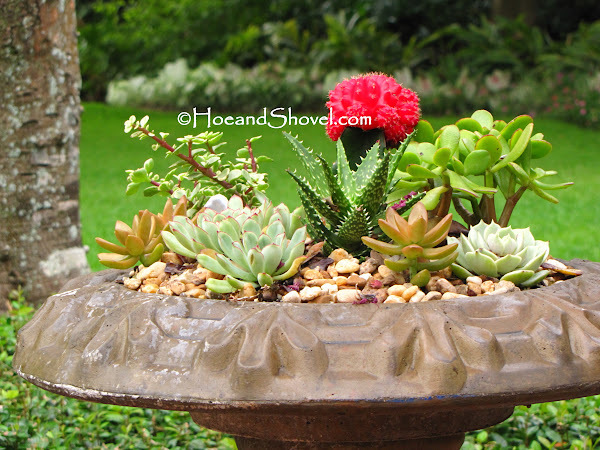 Last year I saw a pretty succulent garden planted in a birdbath while on a tour of a local garden. Ever since then I've wanted one of them for my garden. It was one of those projects that kept getting bumped to the bottom of the "want" list. That's simply because there were SO many plant projects ahead of it this past spring. When Lowe's Creative Ideas handed out the challenge to create something in my garden using Lowe's products it was the spark I needed to get this idea in full swing. My motivation was spurred on by the fact that they gave us $100 to spend. Fun stuff, right! I gathered my materials (2-piece concrete birdbath, assorted succulents, perlite, soil, and pea gravel) from Lowe’s. 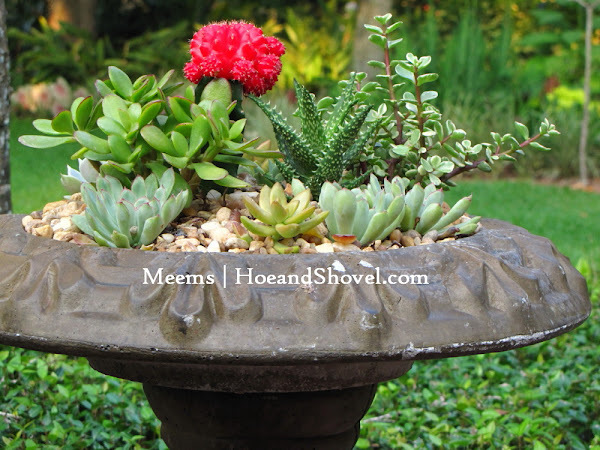 I chose a mix of succulents that appealed to me with varying heights, textures, and forms. The total miraculously equaled $101.30; so off we go. 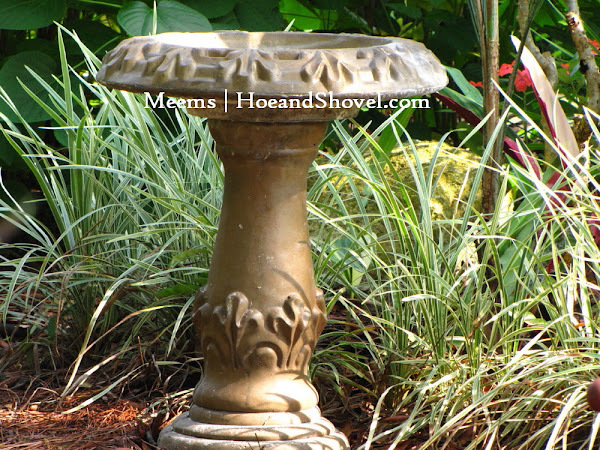 Here are the steps for how to make a birdbath into a succulent dish garden. 1. Create some very good drainage in the dish. With a concrete drill bit I pre-drilled 1/4” holes and then 5/8” final holes making sure to site them just outside the diameter of the pedestal. 2. 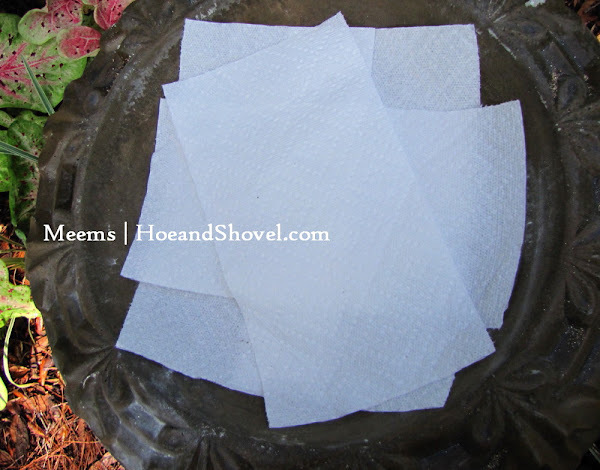 Line the dish with paper towels to keep the soil from falling through drainage holes. (Screen would work well here, too. I didn't have any on hand.) I filled the dish with a mix of potting soil and Perlite (50/50). Because the finished garden will be visible from every side I planted the tallest plants first~ just off-center. 3. Plant. 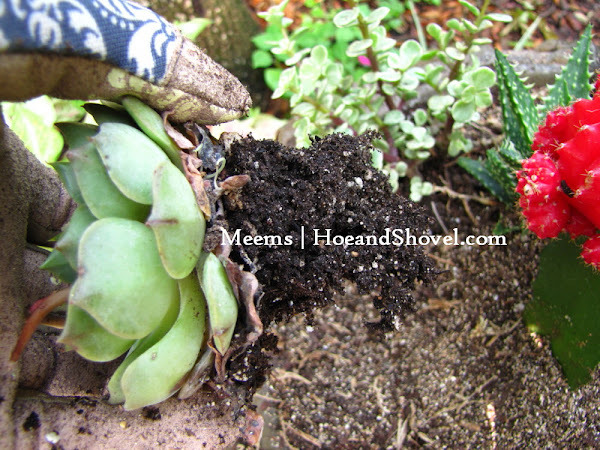 I found it helpful (because of the shallow dish) to knock off most of the existing soil before planting. With the succulents in place I watered lightly. 4. Sprinkle pea gravel into the open spaces and gently press them down. The pea gravel not only looks nice as a finishing touch, but it also helps secure the plant roots into the shallow medium. This is a simple and lasting DIY project I think you could have just as much fun creating as I did! And if all goes according to plan ~~~ durable and long-lasting. Disclosure: My Lowe's blog entries are always written by me in my own thoughts and words. I am being compensated by Lowe's for representing the Gulf Coast Blog for them. Fabulous idea. What a great feature for any garden. Meems ~ That was fantastic and it really lookss quite easy to do. You did a great job. I have a collection of succulents (bought at Lowes) sitting on my patio that I need to plant up. I have been waiting for the right inspiration. I just love succulents. I have an old bird bath that doesn't hold water. All I have to do is get busy. Thanks for the inspiration. I love it and how fun to go shopping with $100 of someboydy elses money. At garage sales I look for teapots for $1. Have gotten some cute ones. 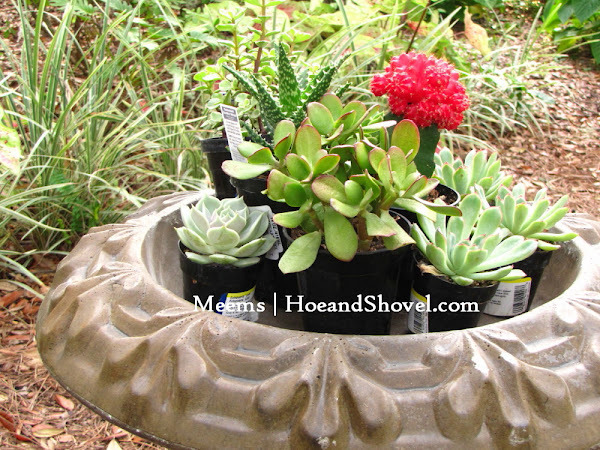 They are great for succulent plantings for my lanai. This is a lot of fun. A lot of people have this type of fountain idea with a cacti theme or succulents...either way, it looks amazing. As soon as I finish with all the hardscape, plants around our property....one of those succulent founntains will grace our El Presidio gardens. Great job! From the photos it looks like a super addition to your already fabulous garden. It looks fantastic. Just another eye candy in your garden. You did a wonderful job. Thanks for something to think about. Succulents have not been a plant I've put too much emphasis on here but I'm starting to like them more and more. It really was very simple and zero upkeep so far. Yay... can't wait to see how yours turns out. You will LOVE doing it. Always more fun to spend someone else's dollars! I'm curious how do the teapots drain? Sounds so cute. I felt the same way as you state. I had so many other things to do first but when pressed to a deadline it was a must and I'm so glad I have it now. I'm enjoying it on the back brick patio. It gets a fair amount of sun and it is not in the path of irrigation so it can stay dry. Thanks for your sweet comment. You are so SWEET to leave me a comment on the Lowe's blog, too. I DO like my power tools I have to admit! I really like the shallowness of the bird bath dish. It seems perfect for these plants. Thank you. Looks great Meems. 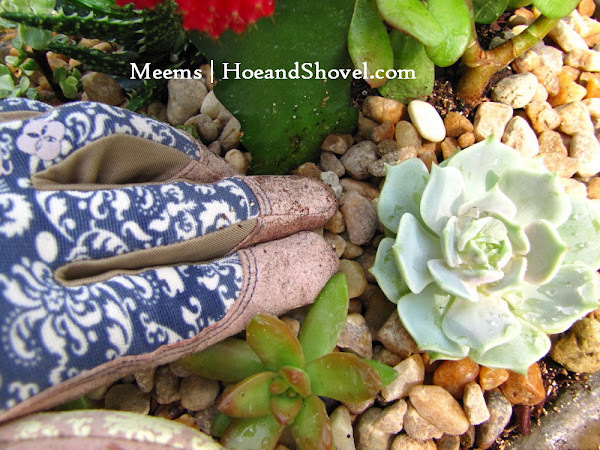 Succulents make wonderful potted plants...especially in summer. The teapots have no drainage, but the only water they receive is from me. It wouldn't work outside with our rains. I have a layers of small pebbles at the bottom and I just have to be careful that I don't water them much. I'm just now learning to enjoy succulents. I don't know much about the ones I chose for this project so I will have to see how they do through winter. since i have been able to 'see' this is person ... just wanted to say it is so adorable! like a miniature garden plot of a different nature ... not like a planted pot (which you have featured before), or an annual which grows and goes ... just a stand alone for pure enjoyment! really like your cacti choices ... and it is low up-keep too! good project! This is wonderful, Meems! I want a succulent table like Matt of the Far Out Flora blog made but I will adapt your step by step instructions to it. Thank you, thank you for mentioning that this Lowe's project was on a gift card. I visited their site and they do give gift cards via email. I'm currently offering a mini raffle now and not being too familiar with much US stores I was stuck with Amazon for an international winner. I will definitely consider Lowe's as an alternative. Thank you for the inadvertent tip.